Cayre, Sutton, Sitt, Adjmi propose six-story retail building at Soho site. 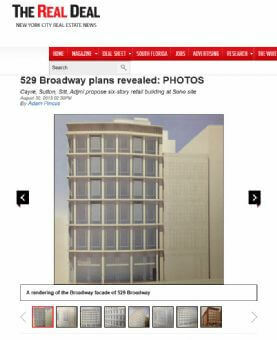 A group of high-powered investors that includes Bobby Cayre and Jeff Sutton is planning to clear the lot at 529 Broadway in Soho and put up an eye-catching six-story retail building that resembles a hotel that stood there in the mid-1800s, The Real Deal has learned exclusively. The site, at the intersection of Broadway and Spring Street, has a two-story commercial building from 1935. The developers want to replace it with a 34,000-square-foot, glass-and-brick structure that has window details adapted from the Prescott House, an 1853 hotel demolished during the Great Depression. TRD filed a request with the citys Landmarks Preservation Commission to review the application, which has not been published before.The panel must approve the plans first because the location is in the Soho Cast Iron Historic District. The developers filed the LPC paperwork, prepared by BKSK Architects and preservation consultants Higgins Quasenbarth & Partners, within the past two weeks. They filed city Department of Buildings plans in July for a six-story structure with just over 34,000 square feet, TRD reported. The new application includes a series of photographs and illustrations of the Prescott House as well as neighboring buildings to put the new design in context. The proposal updates several of the hotels window motifs into a modern design, which morphs and twists along the Spring Street facade from a more traditional look on the western portion to an angular and sleeker finish at the corner with Broadway. The developers tight control over their application reveals the sensitive nature of the citys development review process, which in this case involves a presentation to the local community board as well as the LPC. The project is on the agenda for the LPCs Sept. 10 hearing. The new application includes a series of photographs and illustrations of the Prescott House as Cayre, who is leading the development process, declined both to comment, and to provide digital versions of the images in the slideshow accompanying this article; TRD photographed the images. The developers Cayre, head of Aurora Capital Associates; Sutton, president of Wharton Properties; Joe Sitt, CEO of Thor Equities; and the Adjmi family acquired the building in 2012 for $147.9 million, a record for a Soho retail property.